Pre-set pressure-regulating valve at the head of a drip tape lateral line. Photo: L. Schwankl. 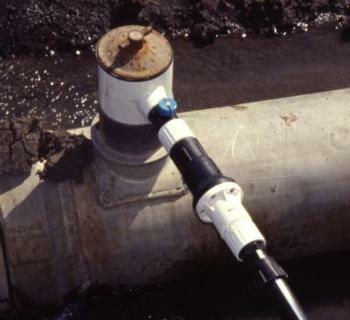 Pressure-regulating valves are used in a microirrigation system to maintain a desired, constant pressure downstream of the regulating valve even if the pressure upstream of the valve fluctuates. These valves can only reduce pressure, so they are often referred to as pressure-reducing valves. They are available as adjustable pressure-regulating valves and as pre-set pressure-regulating valves that you can buy to match the desired downstream pressure. The pre-set regulating valves usually are installed at the head of each lateral line whereas the adjustable regulating valves are often installed at the head of the system in order to regulate the pressure of the entire system. 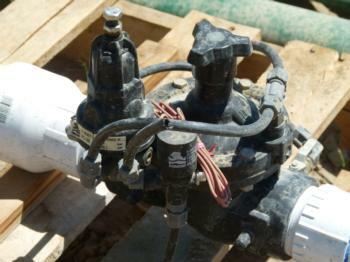 Some system designs use the adjustable regulating valves at each irrigation block to control the pressure. Adjustable pressure-regulating valve. Photo: L. Schwankl. Both the adjustable and pre-set pressure-regulator valves should be periodically checked against new, high-quality pressure gauges to ensure they are delivering the desired pressure. The adjustable pressure-regulating valves usually feature a pressure tap at the valve or just downstream of the valve to aid in pressure adjustment. Some prefer to install a Schrader valve (like a tire valve) at these locations and then use a portable pressure gauge that connects to the Schrader valve. 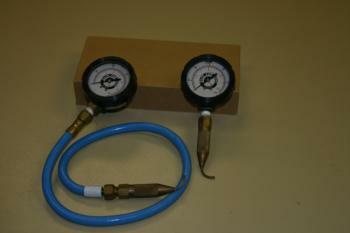 The advantage to this is that you are able to use the same, high-quality, pressure gauge at all the measurement sites and you don't leave a pressure gauge exposed to the damaging elements. The disadvantage of the Schrader valve system is that you need to carry the pressure gauge with you in order to check the pressure. The convenience of simply being able to look at a permanently installed pressure gauge may outweigh the inconvenience of having to periodically (most likely once a year) replace the pressure gauge. Checking pre-set pressure regulators is more difficult since you often have many of them in a system and they do not come with a pre-installed spot downstream where you can measure the pressure. Often the easiest way to check is to randomly choose laterals to monitor, punch a hole in the lateral line, measure the pressure using a pressure gauge outfitted with a pitot tube (see photo) that you insert through the hole, and then plug the hole with a "goof plug." If the randomly selected lines indicate no problems, it is likely that the rest of the regulating valves are also in good condition. If measurements indicate problems, you need to conduct a more thorough and systematic evaluation.